ven though Chaucer does not tell us how the pilgrims traveled, it is easy to trace the way they must have gone. The street leading from Southwark is an old Roman road and today is known as Old Kent Road, and eventually becomes New Kent Road. In Chaucer's day it was called Watling Street, and it can still be followed to Canterbury or to Dover. (Interestingly, Chaucer writes of Watling Street in his poetry, but only in its usage as a common Medieval nickname for the Milky Way.) Leaving Southwark, the travelers would have passed through Deptford, Greenwich, and ended their first day in the town of Dartford. From Dartford they would have traveled to Rochester, crossed the river Medway, then gone on to Sittingbourne, Ospring, and Boughton-under-Blee. From here they would have either continued on Watling Street straight to Canterbury, or would have taken a southerly shortcut through Bob-up-and-down, depending on which road was in the best condition. 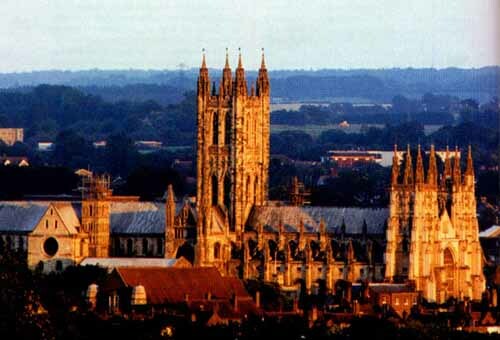 Once they had reached Canterbury, the pilgrimage was over, for to Medieval man the pilgrimage was a symbolic journey that represented the course of human life, from one's home on earth to one's true home in the universal order. A pilgrimage was therefore declared over at its destination, and the return home was not part of the ritual act.